Another meat-free meal (with exception of our bacon crumbles garnish) once we returned from our pig-fest in Madrid. This one was a winner! The fried leeks added a bit of crunch (if you want to take the extra time to do this). We added a bit of sour cream for a bit of extra creaminess, but a half cup of heavy cream would be luxurious. In fact, the potatoes are so starchy that you don’t need to add any cream at all. Saute leeks and garlic in the rendered bacon fat, if you use bacon, or some olive oil until soft. Add potatoes to the sauteed leeks and pour in the chicken or veggie stock. Bring to a boil and then lower heat and simmer for 20 minutes, or until potatoes are falling apart. Add your two tablespoons of sour cream if you prefer a thicker, creamier soup (you could choose to blend first and see what the soup looks like and then add the sour cream and blend again). Add some salt, if necessary, and pepper. 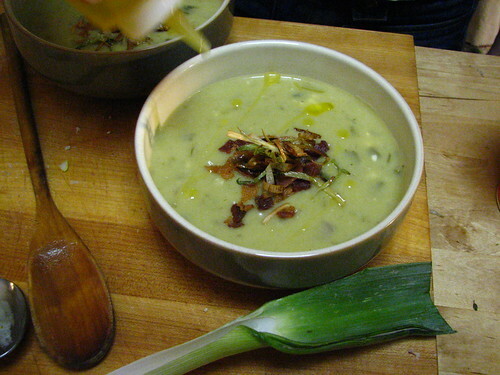 Using a stick blender or a blender, puree the soup. I prefer a bit of chunks in my soup so I often take a bit of the chunky potatoes out while I blend the rest. I then add the chunkier bits back and crush with a fork. (OPTIONAL) In another pan, saute your leek ‘strips’ in some olive oil until crispy for an optional garnish. Dish up and top with some crumbled bacon and fried leeks. This looks just delicious! Soups are a great winter food. This looks great! I was thinking about making potato and leek soup today.